February 23rd; on this day in 1954, a group of children from Arsenal Elementary School in Pittsburgh, Pennsylvania, receive the first injections of the new polio vaccine developed by Dr. Jonas Salk. Though not as devastating as the plague or influenza, poliomyelitis was a highly contagious disease that emerged in terrifying outbreaks and seemed impossible to stop. Attacking the nerve cells and sometimes the central nervous system, polio caused muscle deterioration, paralysis and even death. 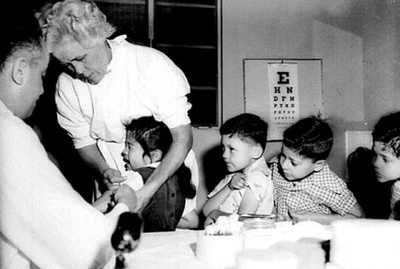 Even as medicine vastly improved in the first half of the 20th century in the Western world, polio still struck, affecting mostly children but sometimes adults as well. The most famous victim of a 1921 outbreak in America was future President Franklin Delano Roosevelt, then a young politician. The disease spread quickly, leaving his legs permanently paralyzed. In the late 1940s, the March of Dimes, a grassroots organization founded with President Roosevelt's help to find a way to defend against polio, enlisted Dr. Jonas Salk, head of the Virus Research Lab at the University of Pittsburgh. Salk found that polio had as many as 125 strains of three basic types, and that an effective vaccine needed to combat all three. By growing samples of the polio virus and then deactivating, or "killing" them by adding chemical called formalin, Salk developed his vaccine, which was able to immunize without infecting the patient. After mass inoculations began in 1954, everyone marvelled at the high success rate--some 60-70 percent--until the vaccine caused a sudden outbreak of some 200 cases. After it was determined that the cases were all caused by one faulty batch of the vaccine, production standards were improved, and by August 1955 some 4 million shots had been given. Cases of polio in the U.S. dropped from 14,647 in 1955 to 5,894 in 1956, and by 1959 some 90 other countries were using Salk's vaccine. A later version of the polio vaccine, developed by Albert Sabin, used a weakened form of the live virus and was swallowed instead of injected. It was licensed in 1962 and soon became more popular than Salk's vaccine, as it was cheaper to make and easier for people to take. There is still no cure for polio once it has been contracted, but the use of vaccines has virtually eliminated polio in the United States. Globally, there are now around 250,000 cases each year, mostly in developing countries. The World Health Organization has set a goal of eradicating polio from the entire world by 2010.